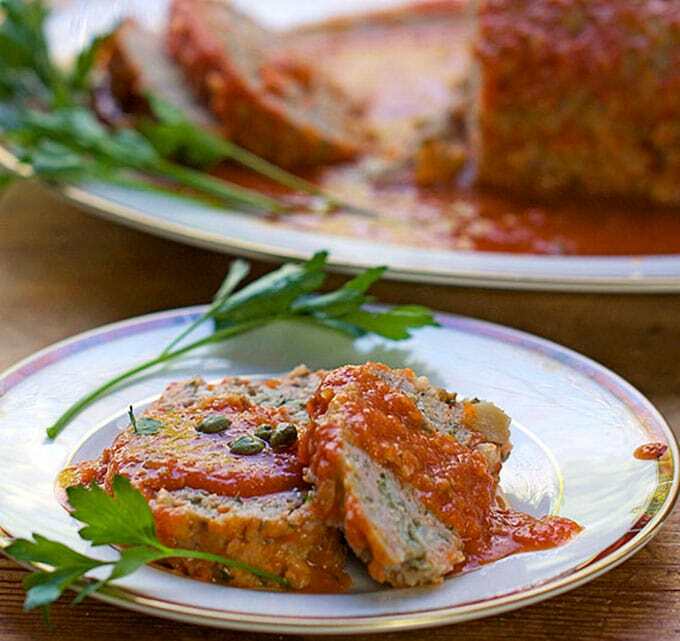 This Sicilian turkey meatloaf recipe is different from the norm. Ground turkey is mixed with mashed potatoes instead of bread crumbs. 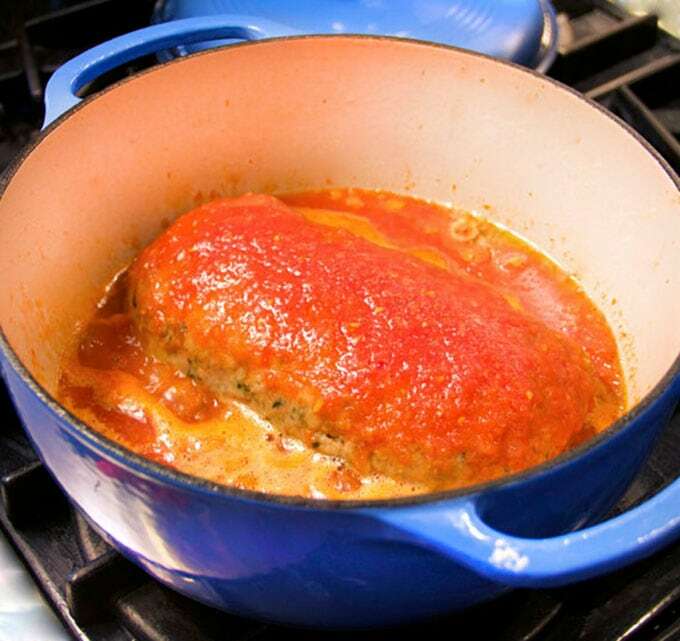 The meatloaf simmers in a covered pot on the stove, in wine-scented tomato sauce. The result is a super tender, flavorful meatloaf with an incredibly delicious sauce to spoon over the top. Meatloaf may be one of the most iconic American dishes, yet it’s also a popular dish across the globe. Dozens of countries have their own version. 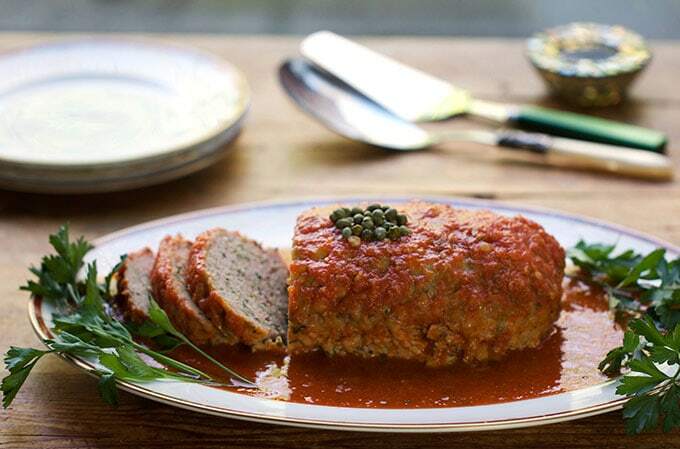 In Italy meatloaf is called polpettone, which means ‘Big Meatball’ – an exciting and comforting concept!
. 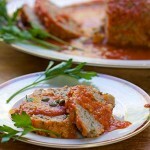 When I came across a recipe for Sicilian style turkey meatloaf, it called out to me and I had to adapt it for PTG. I love the use of cooked potatoes to soften and bind the turkey. I adore the lively fresh flavors of garlic, parsley and capers. It’s an elegant departure from the typical ketchup and breadcrumb meatloaf (not that I don’t love that one too!). 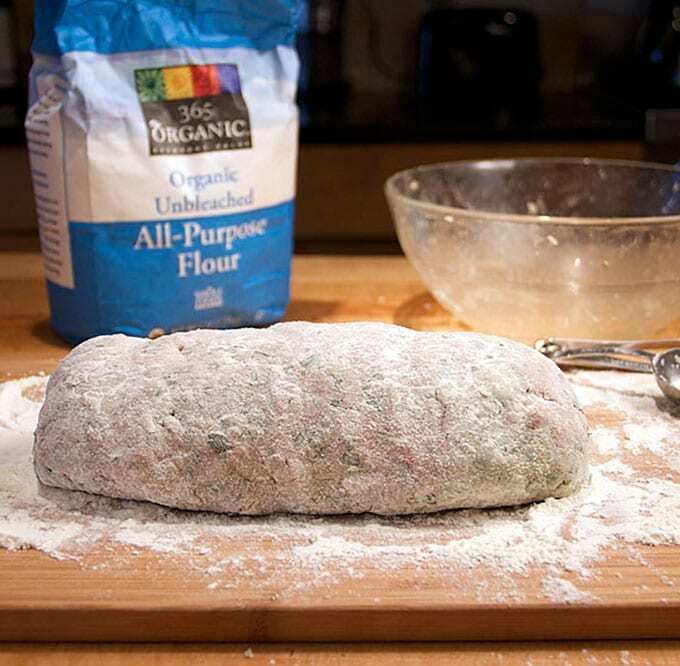 The turkey meatloaf is formed by rolling and shaping the mixture on a well-floured surface. A good coating of flour helps hold the delicate loaf together when it’s sautéed. The floured meatloaf is sautéed briefly in olive oil and then simmered in white wine and pureed tomatoes. 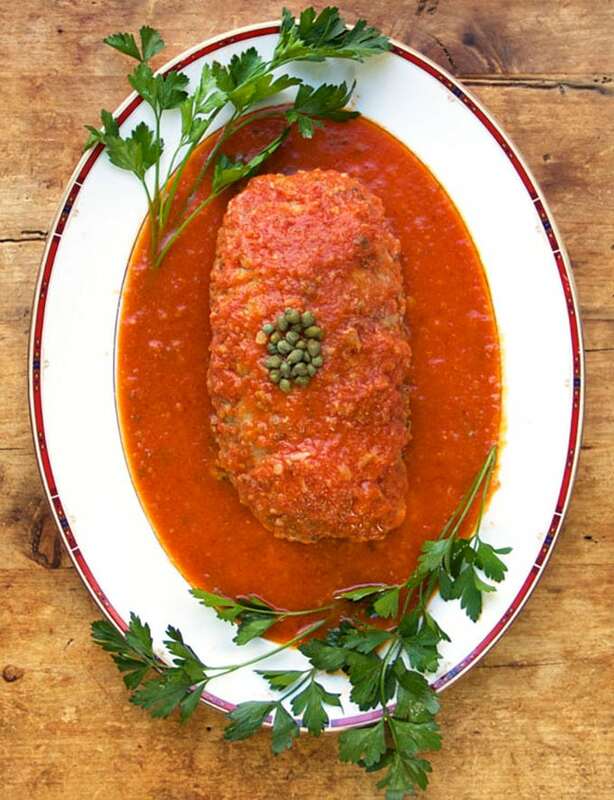 You end up with a tender, melt-in-your-mouth, brightly-flavored turkey meatloaf, drenched in wine-scented tomato sauce. 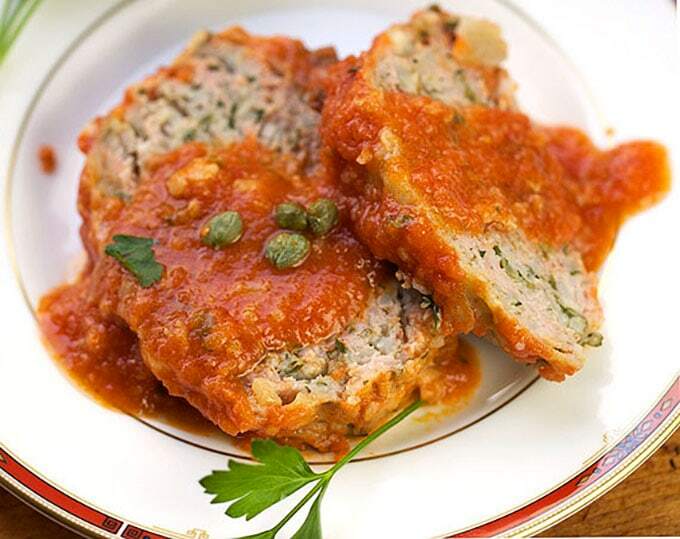 Here’s the recipe for Sicilian Turkey Meatloaf. If you make this, I hope you’ll come back to leave a review and let me know what you think. Author: Panning The Globe, Adapted from "Foods of Sicily and Sardinia"
In a large bowl combine grated potatoes, ground turkey, garlic, parsley, capers, anchovies, oregano, 1 teaspoon salt, 1/4 teaspoon pepper, and 3 tablespoons flour. Use your hands to fully combine everything. To Cook The Meatloaf: Heat the olive oil over medium heat in a large heavy pot or Dutch oven with a lid. When oil is hot but not smoking, carefully transfer the meatloaf (I suggest using two spatulas) to the pot. Sauté for 2 minutes and then gently and carefully turn the meatloaf over and sauté for 2 minutes on the other side. Pour in the wine. Lift the loaf up a bit with the spatulas to let some of the wine slip underneath. Cover the pot. Lower the heat to a simmer. Cook for 15 minutes, shifting the loaf once or twice to allow the wine to get under it. Pour the pureed tomatoes over and around the meatloaf. Sprinkle a pinch of salt and a few grinds of pepper over the tomatoes. Cover the pot and simmer for 20 minutes more, basting the loaf, from time to time, with the sauce. Remove the pot from the heat and let the meatloaf rest, covered for a 1/2 hour. Carefully transfer the meatloaf to a platter. Just before serving, heat the sauce and pour it over the meatloaf. Slice and serve each slice topped with some sauce. Add parsley and capers to garnish, if you like. This is incredible, And when you have leftovers you can just cut a slice of it, put it between two pieces of bread and cook it in a pan or panini press if you have one. Have not made this yet, but when I do I will probably add something for texture. I often find that ground turkey is ground so fine that cooked product doesn’t have the right mouth feel. I’ve had success with adding celery or even better, diced water chestnuts. Not too Sicilian, I know, but I doubt ground turkey is either. Nice idea – let me know how it turns out if you make it! I’m late to arrive upon this post. However, I recently tried this recipe and loved the creativity it inspired in my cooking. I did get a dryer result than I expected, so I’m looking for tips on how to keep the loaf more moist. I may try adding half dark meat turkey meat to the white meat and also make sure I’m not adding to much potato into the recipe. Yum! I love meatloaf but often don’t feel like having that much red meat. So this version has all the taste and none of the meat “issues.” I love the addition of anchovies – you and I are among the few who do love those salty fish:), but that’s OK, I’ll invite you over and we can have this meatloaf with a baguette, a beatuiful salad and lots of wine. . I only ever make my Mom’s traditional all-American meatloaf. This Sicilian one looks so flavorful, and clearly I need to branch out! Made this recipe this past weekend and wow, was it ever a hit!!! I doubled everything just to have leftovers…..even better the next day. And yes, the anchovies really add flavor, so stick to Lisa’s recommendation. This was by far THE BEST meatloaf recipe I’ve ever tasted! Thanks Nina, I’m really happy to know that you enjoyed the meatloaf :)! I am a MAJOR meatloaf lover. I even order it in restaurants. Normally I only order things in restaurants that I don’t cook well or never heard of or am too lazy to fix. But I see meatloaf on the menu and my eyes light up like a creature in a horror movie. This is an outstanding meatloaf. Wow, well done! Oh, this looks so delicious – Lisa – love Sicilian flavours.